I’ve been surprised lately about how little everyone, especially my own friends and family, knows about all the Super Bowl XLVI-related festivities Central Indiana has planned in just a few short weeks. Who knows when or even if Indianapolis will get to a host another Super Bowl. So, for most of us, especially those of us who are football fans, this Super Bowl 2012 celebration perhaps will be a once-in-a-lifetime opportunity. Numerous public activities are planned in Downtown Indianapolis and at Hendricks County’s Super Celebration Site, the Metropolis Shopping Center in Plainfield, Indiana. We will have more on all the activities at Metropolis and a guide to your best options to navigate Downtown in upcoming posts on All Access Hendricks County. So, stay tuned for that. Today, I will focus on just a few of the exciting things to see and do in Downtown Indianapolis during the 10 days leading up to Super Bowl XLVI. NFL Experience — This is perhaps the most talked about attraction, and one I’m personally looking forward to most because I will get to see it through the eyes of my 4-year-old son. 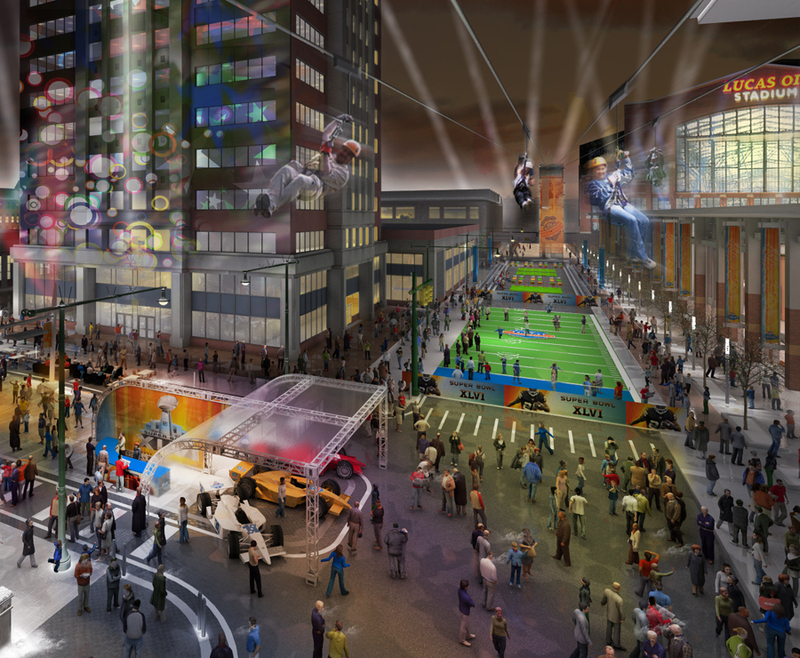 In its 20th year as part of the Super Bowl and described as an interactive football theme park, the NFL Experience, which will be housed in the Indiana Convention Center, continues to grow every year. 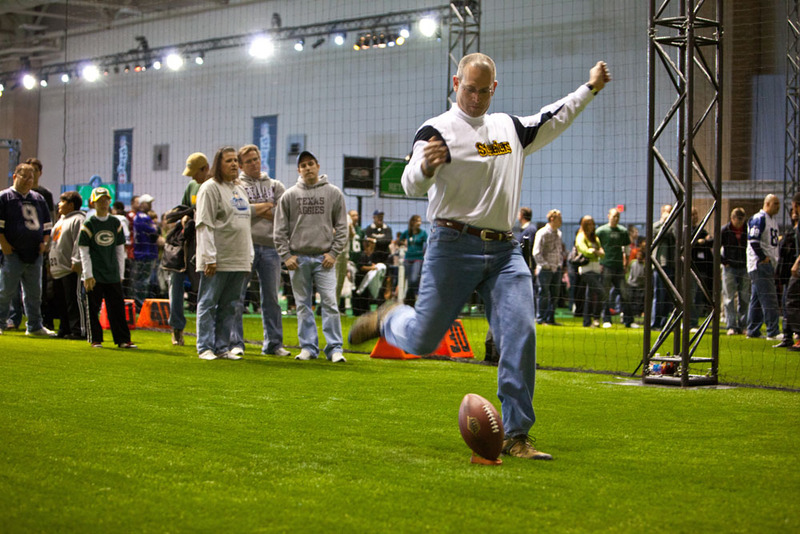 The NFL Experience boasts interactive displays that put you on the field, kids&apos; football clinics, free autograph sessions from more than 50 past and present NFL stars, the largest football memorabilia show ever and numerous displays, including an up-close look at the Vince Lombardi Trophy. Details: Tickets cost $25 for adults and $20 for children 12 and under. Website. Super Bowl Village — This free, family-friendly outdoor entertainment center just east of the NFL Experience will completely transform Georgia Street into a three-block, pedestrian-friendly fun fest for 10 days. More than 80 local, regional and national singers and bands including Bret Michaels, Twin Cats and LMFAO, will perform free concerts. A list of all the performers and a schedule of performances can be found here. The Village also will include warming zones, a free vortex dome with interactive gaming, a Tailgate Town featuring tailgating favorites, such as corn hole, and plenty of food and hot and cold drinks. Details: Cost is free. Website. Zip Line over Capitol — Actually part of the Super Bowl Village, I separated this because it has probably been the second most talked about attraction Downtown during the Super Bowl festivities. In fact, by the time you read this, all of the “tickets” for the zip line through Ticketmaster likely will be sold out. But really, the tickets are the equivalent of a fast pass that get you to the front of the line. Dianna Boyce, director of communications for the 2012 Super Bowl, assured me that those who want to ride on the 96-foot high, 800-foot long zip line, will get that opportunity without a reservation if they are willing to wait in line. A co-worker and I plan to go Jan. 29, and we will blog and maybe even have video from that experience. Details: Cost is $10. Website. Media Day — For the first time ever, the public can buy tickets to one of the craziest events that occurs each year during Super Bowl week. Media Day lacks only a big top and some elephants to become a full-fledged circus. Thousands of “media representatives” worldwide descend on the Super Bowl every year for this event to interview the players and coaches from the two teams. Fans can purchase a limited number of tickets to sit in the Lucas Oil Stadium stands and be part of the experience including receiving a Media Day Gift bag with a radio to tune into NFL Network&apos;s coverage and hear players&apos; interviews at the podium. Details: Tickets for the Jan. 31 event cost $25. Website. Super Bowl Stadium Tours — Fans can explore the Lucas Oil Stadium grounds, observe preparations for the Super Bowl, walk on the field, visit both team locker rooms and more. Details: Tickets cost $15-$30 depending on the day. Tours are available Jan. 23-30, Feb. 1-2 and Feb. 6-7. Website. Super Bowl Media Center Fan Gallery — Another interesting event provides behind-the-scenes access to portions of the Media Center on the third floor of the JW Marriott. 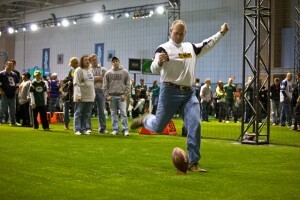 See NFL players, celebrities and other athletes interviewed on NFL Network, ESPN and Radio Row. Details: Tickets will be free and available during the peak hours of operation Feb. 1-3. Website. Head down between Jan. 27 and Feb. 1 if possible when there should be much less congestion. If you’re a visitor to the area, we still have plenty of hotel rooms available from Jan. 27-Feb. 1 in Hendricks County, which is only about 15 minutes from Downtown Indianapolis. Click here for a list of all our hotels or call the Hendricks County Convention and Visitors Bureau office for specific availability at (800) 321-9666. Sign up for an e-mail subscription to All Access Hendricks County in the upper right hand portion of this page for future updates on all Super Bowl-related and other tourism happenings both in Indianapolis and here locally in Hendricks County. Finally, now that you&apos;re informed please share this post with your friends and family either by Facebook, e-mail or word of mouth. We hope you enjoy your visit and have a Super time!